Web-based document management software is the best way to store and organize all your documents in one secure location. Moving to the eStudio cloud means the right people can access company files from anywhere, better organization, improved workflow and proper data security. Our nested folder design is easy to use. Restrict folders so only specified people have access. Easy check in/out keeps the working files in front of the right people. When it is approval time a few clicks auto-route files from person to person for sign-off. Create eTeams to protect data so specified workgroups can collaborate on content without putting the business at risk from prying eyes. Getting your files into your eStudio cloud is easy. Drag files right into your browser. Upload from any Apple, Windows or Android device. Email files to your personal eBox. 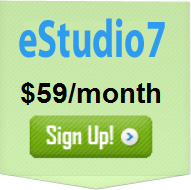 eStudio users can even share files from their Dropbox or any public URLs. Send extra large files or hundreds of little ones via FTP. 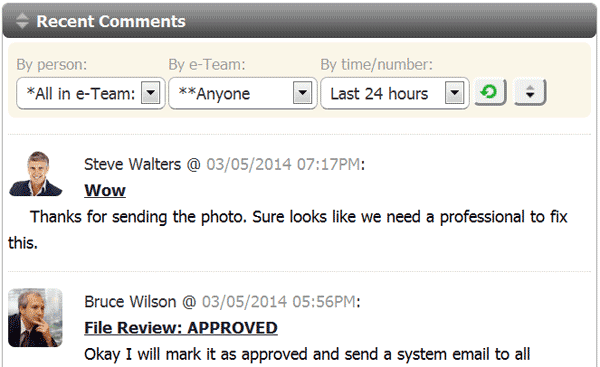 Exchange feedback in one place, whether it's a quick comment or an in-depth discussion about company files. Our Comment Streams keep everyone on the same page. Everybody can rely on our messaging solutions to stay connected with your business documents. SMS text alerts and emails are consistently delivered to the right people, making the management of your files easier. The correct version of the file is always in your eStudio cloud. Every file you upload or link to in eStudio can be found BY SEARCH, TAG CLOUD OR THUMBNAIL. Build your own color scheme, add your logo, customize invitations & integrate our login form with your site. Backup critical business files to your secure eStudio account. Download a zipped file of all files, logs & comments or just zip up a folder of files. We even keep backups of our backups. If a simple file sharing site is inappropriate for your business and you are ready to get everything organized it is time to sign up for eStudio. Whether your business is a small company managing a few jobs at a time or a large enterprise working on hundreds of compliance documents, eStudio's document management software can be customized with just a few clicks to suit the way you work.